Who doesn’t like Team Fortress 2?! Ever since the game was released a few years ago, it has become one of the most heavily featured properties to emulate in the cosplay community! In fact, a couple of years ago, my friends and I did a whole team of characters from Team Fortress 2. 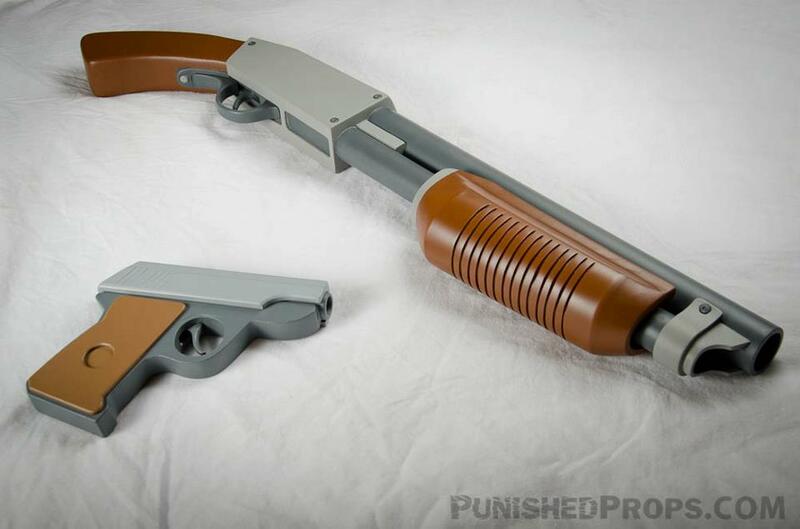 Anyway, a few months ago I was tapped to make some TF2 prop replica guns, and I have finally delivered! I present to you the humble shotgun and pistol. More pictures here. 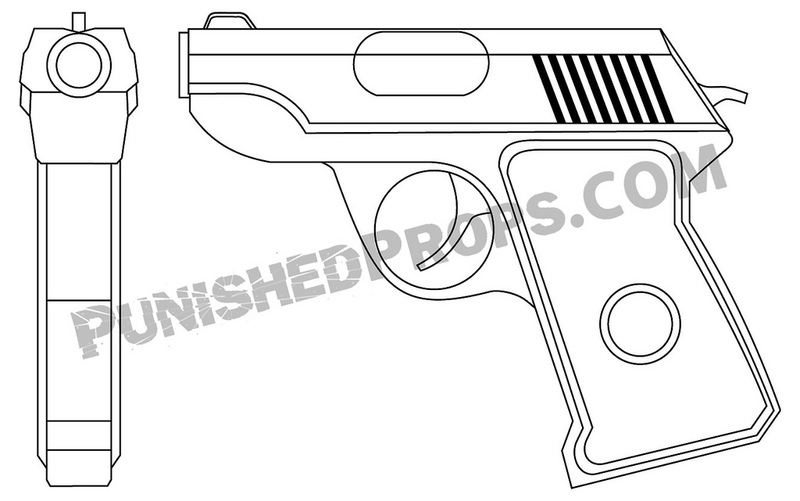 As per my usual style, I created vector line drawings of each gun in Inkskape. They were both printed out full size and used as templates for cutting out the pieces. Full size versions of the vectors can be found on my store. With the vectors printed out, I set about planning the build. 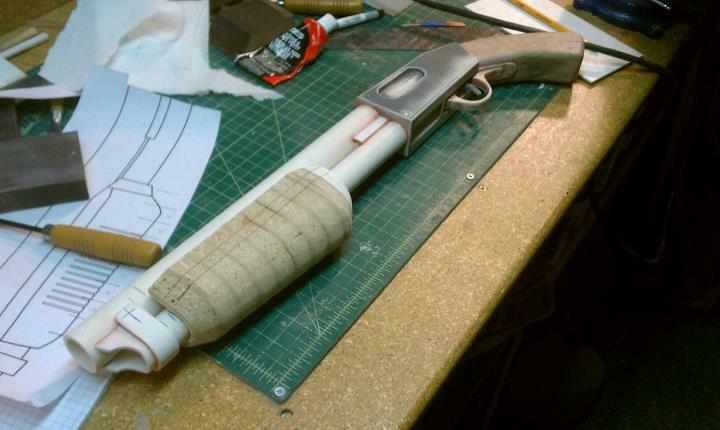 The barrels for the shotgun were the right size to use common PVC pipes, which is super helpful. 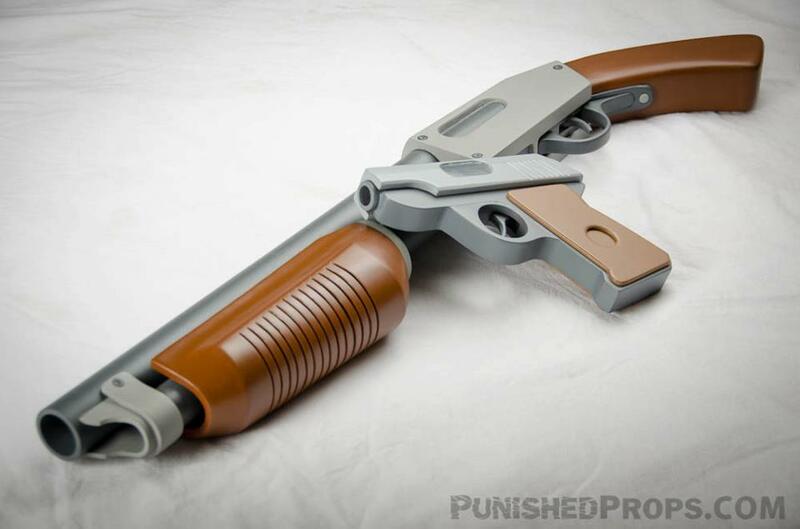 All of the pistol was completely custom though. 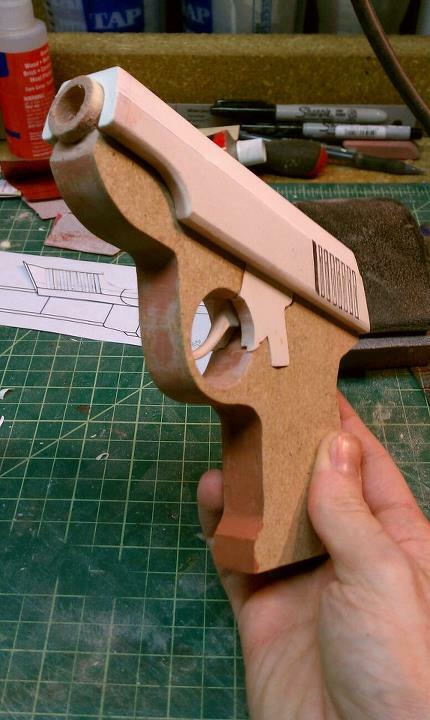 The main body of the pistol was cut from a piece of MDF and the barrel was carved from a dowel. There needed to be a functioning trigger so I carved a cavity using a router bit on my Dremel. 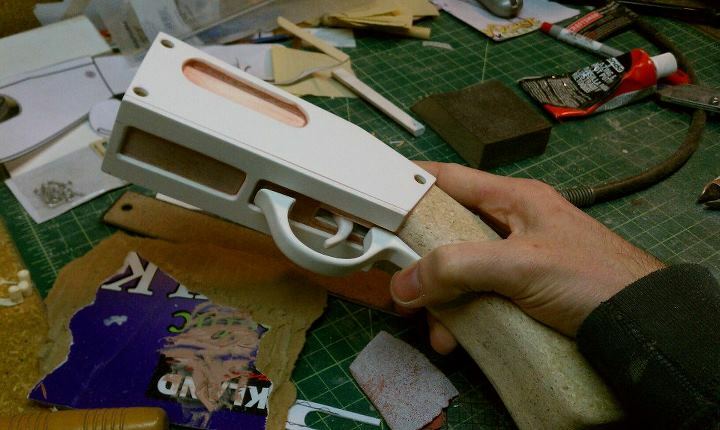 The trigger was carved from a piece of foam PVC. 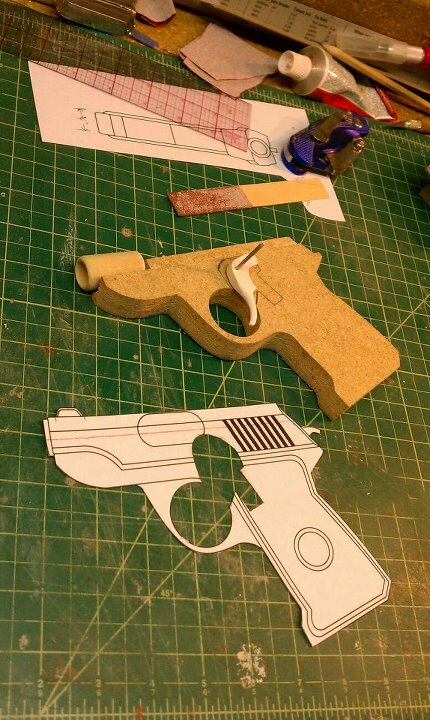 The side pieces of the pistol handle were cut from 1/8″ foam PVC. The slide (which needed to move) was cut from 1/4″ foam PVC and built like a box. I sanded the sides a bit to give it a taper. 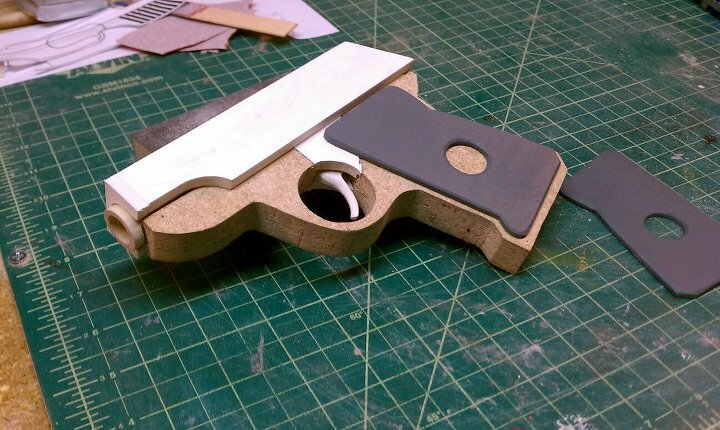 I also covered the trigger cavity with a piece of 1/4″ foam PVC. The raw ends of the MDF needed to be filled, so I used Bondo’s air drying filler. 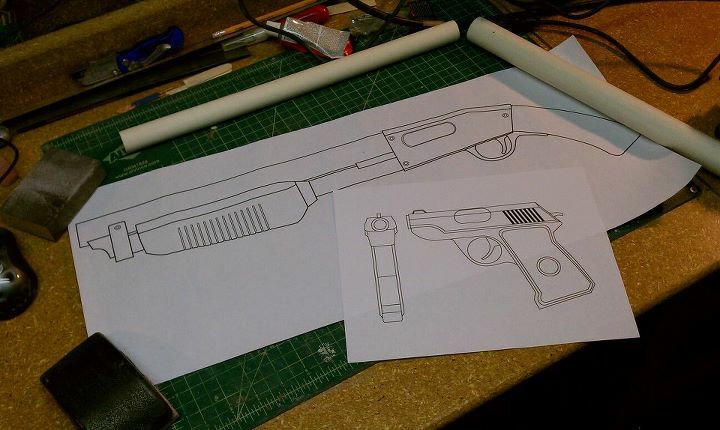 With the pistol nearing completion, I started on the shotgun. The handle area was cut from two pieces of MDF that were glued together. Here we jump forward a bit, I didn’t take many photos. 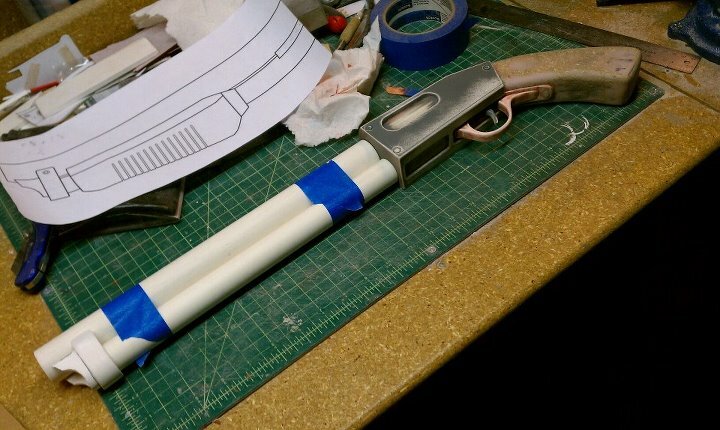 The sides and bottom of the shotgun body were cut from 1/8″ foam PVC (I have a lot of it lying around as scrap, might as well use it all!). I also drilled holes in the side pieces for the rivet looking bits. The shell ejecting port thing on the left side of the body is actually a piece of PCV pipe that I buried in the MDF. The trigger for this was done in a similar fashion to the pistol. 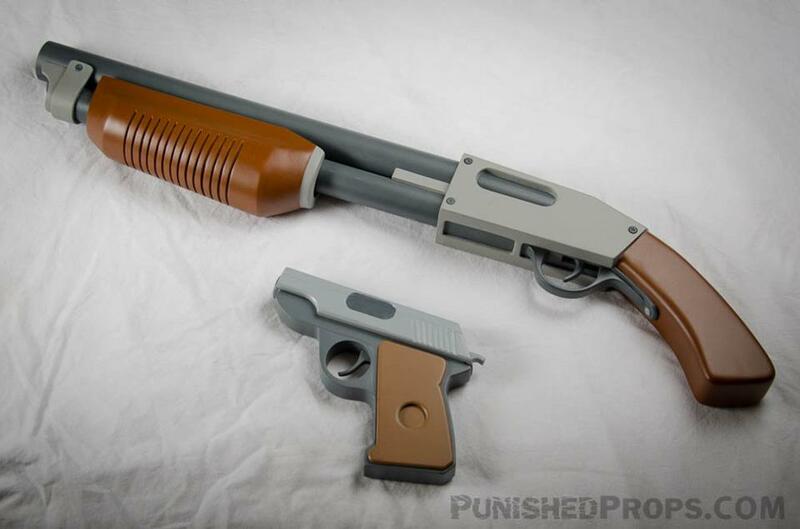 The trigger guard was carved from a piece of 3/8″ foam PVC. It isn’t pictured, but the shotgun barrels have pieces of dowel screwed and glued into the main body that they were then epoxied over. This way they are both chemically and physically attached. 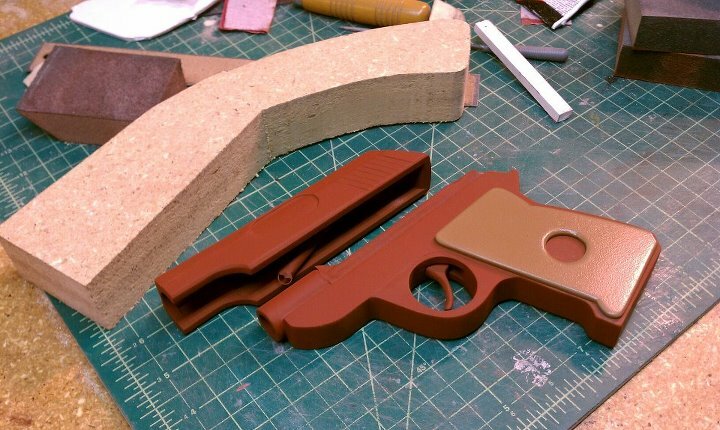 This is the weakest part of the gun, so I wanted it to be as durable as possible. 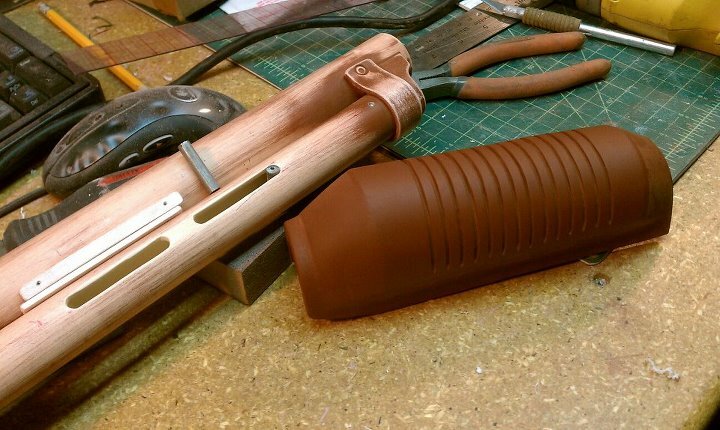 The end pieces that attach the barrels are PVC that was heated, bent and then carved to shape. Hidden under those pieces is a nut & bolt that connect the barrels. The pump on the shotgun was the most challenging bit. It needed to function and look good. 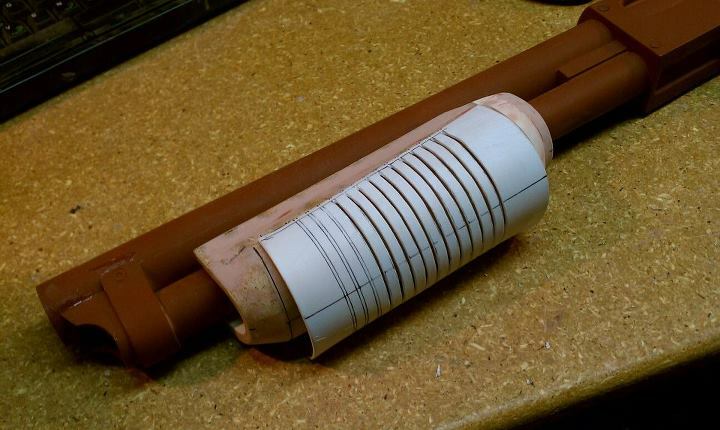 I started by bending a sheet of PVC over the bottom barrel to serve as a base. Then I cut out pieces of MDF like ribs, each one getting a little bit bigger to accommodate the taper of the handle. They were all glued together and then sanded down. The handle got some more shaping with a Dremel sanding bit. To get the grooves I heated and formed a piece of styrene over the whole thing and then cut slots into it with a cutting bit on my Dremel. This way I knew that all of the slots would be uniformly deep and (mostly) straight/parallel. The handle then got lots of priming and sanding love. The mechanism for pumping it is built on some aluminum rods that are attached to a spring inside of the barrel. The rods were put on pins that went through a PVC strip that was then epoxied to the inside of the pump handle after painting. This setup was a bit convoluted, but it seems to have worked pretty well. I don’t have any progress photos of the painting process, but it was mostly lots of masking and airbrushing. I went with flat colors to give it the cartoony look that you get in TF2.